Marine wildlife in Scotland is being put at risk by boats straying too close, a wildlife group has claimed. The Partnership for Action Against Wildlife Crime in Scotland said those responsible could be breaking international law. Several incidents have been reported to them across the summer in Shetland and at locations down the east coast. The group said taking boats too close could endanger the animals and the people watching them. 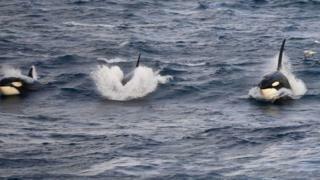 In Shetland, a photographer was allegedly seen circling a pod of killer whales so closely that it split the pod. Boats have been reported very near to humpback whales at St Cyrus, and there has been concern about the impacts on dolphin populations at Chanonry Point in the Moray Firth and around Aberdeen harbour. Police Scotland wildlife crime co-ordinator Sgt Andrew Mavin said: "These animals are extremely powerful and people shouldn't get too close for obvious reasons; there is also a possibility of injury to the animals themselves from boats and other marine craft. "There are clear guidelines available for watching marine wildlife, so ignorance of the law is not an excuse. "I encourage anyone witnessing a suspected crime to contact police Scotland on 101 as soon as possible. "Details of the boat or craft are essential to help us identify the operator." Whales, dolphins and porpoises are protected under law from disturbance, whether reckless or accidental. Anyone found guilty of an offence would be fined up to £5,000. Scottish Natural Heritage (SNH) marine ecology advisor Fiona Manson said: "I'd encourage anyone visiting the coast for wildlife watching to read the Scottish Marine Wildlife Watching Code. "It provides clear advice on how to act responsibly to keep within the law - and also on how to get the most out of your wildlife watching."